Posted By:Unknown | At:12:08 AM Be the first to comment! This is just another thing in a long list of things that makes you go hmmmmm...when it comes to the scandal surrounding Bishop Eddie Long. So it looks like the alleged theft of Bishop Eddie Longs belongings will go unpunish since the county district attorney has decided to drop the charges at the request of Long. Now maybe it's just me, but how many people you know would allow someone to steal from them and let it to go unpunish? Maybe Bishop Long is trying to follow the tenets of Christ and turn the other cheek, or maybe it was something a little more sinister. Either way, the whole thing is just crazy and I don't think we'll ever fully know the truth. 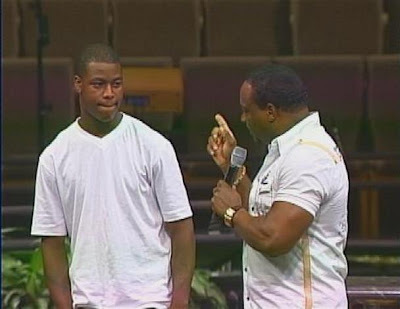 DeKalb County District Attorney Robert James said Monday he will honor a request from Bishop Eddie Long to dismiss burglary charges against a former security guard charged in a 2010 theft at New Birth Missionary Baptist Church. "We decided to cut our losses," said James, adding prosecution would be complicated by Long's reluctance to testify against Anthony Boyd. Also, "the defendant is not accused of using a weapon and doesn't have a bad criminal history." Boyd, 20, on Monday told the AJC that he spoke to Long last week and was told, "You don't have anything to worry about." Long tried last August to convince then-District Attorney Gwen Keyes-Fleming to drop the burglary charges against Boyd. Long moved to have the charges dismissed after learning he would be called to testify, David Fife, attorney of Anthony Boyd, said.